Steven Caulker has had his ban lifted at a Uefa appeal into October's racism-affected Under-21 qualifier between England and Serbia, but team-mate Tom Ince's suspension has been upheld. Tottenham defender Caulker, 21, had been given a two-game ban but will now instead do a day's community service. Blackpool winger Ince, 21, will still miss England's European Under-21 Championship opener this summer. And Serbia Under-21s will now play two competitive games behind closed doors. Caulker and Ince, as well as four players and two coaches from Serbia, were originally handed bans after ugly scenes marred the end of the play-off second leg in Krusevac. England had won the match 1-0 to complete a 2-0 aggregate victory which ensured their qualification for June's finals in Israel. 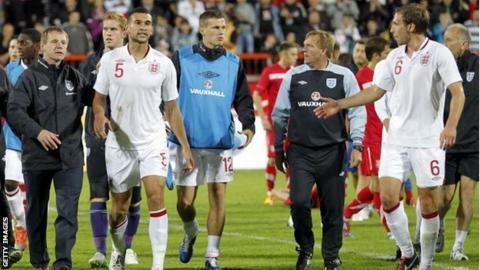 The scuffles followed racist chanting from some Serb fans towards England players. Uefa's original disciplinary panel also fined the Serbian Football Association £65,000 and ordered them to play only one competitive Under-21 match in an empty stadium. Furthermore, their fitness coach Andreja Milutinovic had his punishment doubled - from one year to two - while midfielder Nikola Ninkovic will serve three matches on the sidelines rather than two. The original sanctions were widely viewed as being overly lenient and an appeal panel hearing was convened at the governing body's headquarters in Nyon, Switzerland. Ince and Caulker were joined at the appeal on Friday by their manager Stuart Pearce and two FA legal representatives. "From Steven's point of view he was delighted to hear the news that his two-match suspension is overturned," FA spokesman Scott Field told BBC Radio 5 live. "That's very much welcome from his point of view. For both players this is their last opportunity to go to an Under-21s tournament. "Tom, whilst clearly disappointed, accepts the one-match verdict. We must bear in mind that we walked into the hearing facing the possibility of a two-match ban for Tom Ince and a three-match ban for Steven Caulker. "So for Steven to walk out without sanction in terms of match bans, and for Tom only to face the one match, I think we see that as positive from the players' point of view ahead of this summer's tournament."